In the age of the customer, our efforts to prioritise personalisation is critical to the success of our marketing. And while personalisation can be a multi-faceted matrix, it doesn’t have to be complicated and difficult to get started. Our guide below will help you make sense of personalisation and get you ready to embrace it in your efforts to accelerate business growth. In an already over-saturated market, catching the attention of audiences is proving increasingly difficult. To cut through the noise, marketers are turning to personalisation - one of the few approaches that pique the interest of jaded audiences. In his presentation at the 2018 ADMA Global Forum, Marcus Marchant, Chief Digital & Innovation Officer at QBE stressed the need for personalised marketing in the saturated, noisy environment we live in today by reminding us that "73% of customers preferred brands using personal information to make their shopping experience more relevant...with 80% likely to make another purchase." Infosys. That's more than enough reason to invest in personalisation! While personalisation can mean different things to different people, we define it as highly targeted and customised communications that are relevant to a specific individual or group. Scaling personalisation goes well beyond sending an e-mail to customers addressing them by name or sending a promotional voucher for their birthday each year. In fact, Kristian Bannister states “only 8 percent of consumers would be likely to engage with marketing that addresses them by name and a mere 7 percent of consumers would be likely to engage with marketing that mentions their birthday.” As consumers, we've simply become more sophisticated than that. Rather, it’s about creating relevance and value by designing and delivering tailored messaging to each customer across multiple touchpoints and channels. While you may think you already know your segments or personas, it’s always worthwhile revisiting them, as the foundation of any personalisation strategy begins with understanding your niche audience segments well. If you find a gap, go through the customer discovery process again and identify 3-5 key personas to get started. What type of messaging should be used? What are the best channels to use for each message and customer? When are the best times and points in the journey to target customers? How many times should that message be delivered? These help you identify high value touchpoints and inform what message you should be sending and when. It can also serve as an opportunity to re-think your content architecture and allocate content assets accordingly. This is a point Marcus also honed in on during his presentation, reminding us that marketers don’t need to stress about creating personalised content for every customer or every page of their site. Rather, they can adopt a similar approach to re-purposing evergreen content, by tailoring key messaging, rather than creating a large inventory of highly specific content. 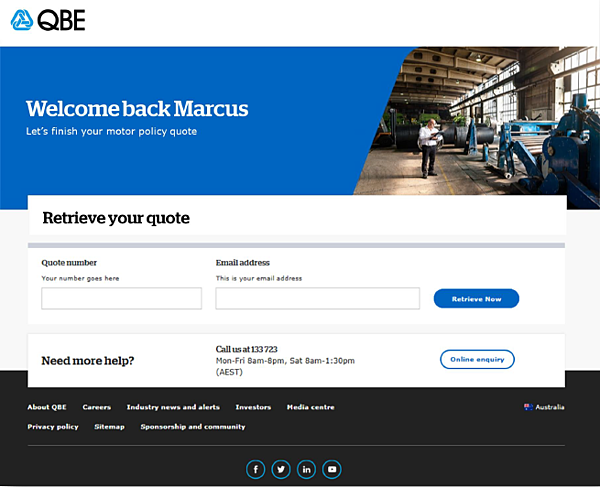 Using QBE as an example, Marcus explains how by identifying that a user has previously completed a quote, the home page can be personalised on the next visit to guide the user back to where they likely want to go. Win for the customer by making the journey easier. Win for QBE by removing friction from the sales process thereby helping to improve conversions. While you might be on the hunt for the perfect personalisation strategy, there is always room to improve and adjust. As marketers, we must continually analyse, test and adjust our activity to ensure we find the right combination of content, creative, channel and timing. Because set and forget is not a strategy, it's a sure fire path to frustration and failure. What we know for sure, is we’re transitioning from an era where market segments are filled with groups of consumers to many 'markets of one'. So it’s no longer about standardising value at scale, rather, customer expectations demand our focus to become truly customer-centric, make their journey easier, and deliver more value to our organisations at the same time. Need help with your personalisation strategy?